Last major update issued on May 3, 2010 at 03:00 UTC. The geomagnetic field was quiet to major storm on May 2. Solar wind speed ranged between 285 and 724 km/s. Solar flux measured at 20h UTC on 2.8 GHz was 79.5. The planetary A index was 39 (STAR Ap - based on the mean of three hour interval ap indices: 38.8). Three hour interval K indices: 11246665 (planetary), 11244544 (Boulder). New region 11066 emerged in the southeast quadrant on May 1 and was numbered the next day by NOAA/SWPC. Slow development was observed during the day. 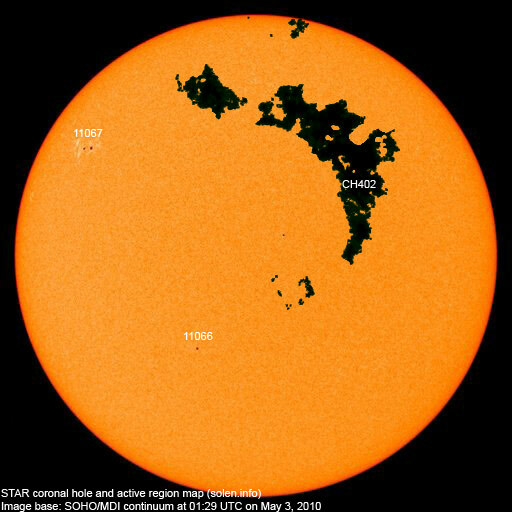 New region 11067 rotated into view at the northeast limb on May and was numbered by NOAA/SWPC the following day. The region developed penumbra on both polarities during the day. April 30 - May 2: No obvious Earth directed CMEs were observed in LASCO or STEREO images. A well defined recurrent coronal hole (CH402) in the northern hemisphere was in an Earth facing position on April 30 and May 1. Processed SOHO/EIT 195 image at 23:48 UTC on May 2. The darkest areas on the solar disk are likely coronal holes. Long distance low and medium frequency (below 2 MHz) propagation along paths north of due west over high and upper middle latitudes is very poor. Propagation on long distance northeast-southwest paths is poor. 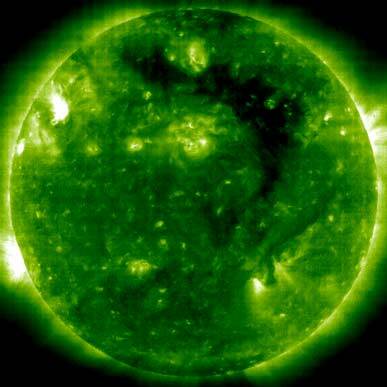 The geomagnetic field is expected to be unsettled to minor storm on May 3 and quiet to unsettled on May 4. Quiet conditions are likely on May 5-7.